The 596m-high tower will be the tallest building in Northern China and the world’s third tallest building upon its completion in 2017. Image courtesy of P&T Group. Resembling a walking stick, the tower features a diamond-shaped crown at its top. Image courtesy of P&T Group. The 117-storey tower was topped-out in September 2015. Image courtesy of Arup. Goldin Finance 117 will be a centrepiece of the Goldin Metropolitan project that is being developed by Goldin Properties Holdings. Image courtesy of Amazingloong. The tower is poised to become the tallest building in Northern China and the world’s third tallest building, upon completion. Construction of the skyscraper has been topped off and is expected to be completed in 2017. The construction began in 2008 and was expected to be completed by 2014 but halted in 2010 only to be resumed a year later. Designed to be the centrepiece of the Goldin Metropolitan project, the tower will be part of an overall development comprising villas, residential buildings, offices, hotels, retail, convention centre, entertainment centre, polo club and green space. "The tower is poised to become the tallest building in Northern China and the world’s third tallest building, upon completion." The tower has been designed by P&T Group and aims for LEED platinum certification. It is also credited with having the largest construction area in the world. The tower is designed to enhance Tianjin’s skyline with its unique diamond-shape crown at the top, which will serve as an atrium with its glazed space. It is designed to hold an indoor pool and fine dining options that will also provide guests with magnificent views. The tower resembles a ‘walking stick’ due to its lean and tapering form and diamond-shaped crown. Exhibiting a square plan, the structure gets leaner with height and delivers a tapered shape on elevation. Sky gardens are also included in the design of the top floors to highlight greenery and allow fresh air to add to the experience of the guests. Clad with a reflective, unitised glass curtain wall, the aesthetic structure will rise majestically in the central business district. The extremely slender building has a height-to-width ratio of 9.5, which is more than the limit set by Chinese seismic code. As such, the structural requirements of the tower are altered to adapt to a highly seismic zone. To fulfil the requirements for earthquake and wind safety, the tower has a perimeter frame consisting of mega composite columns, mega braces and transfer trusses. Its core is formed of reinforced concrete and comprises composite steel plate wall. Mega columns rise from the four corners of the building to reach the top of the crown. They connect beams, transfer trusses and mega braces, all of which are concealed by the building’s curtain wall. The core passes through the entire height of the tower and arises from the top of the pile cap to the roof. Rectangular in plan and centred, the core consists of steel-reinforced concrete shear walls with embedded steel sections. To prevent shear failure of the concrete walls in case of a severe earthquake, steel plates are added alongside the steel sections to form composite steel plate walls. 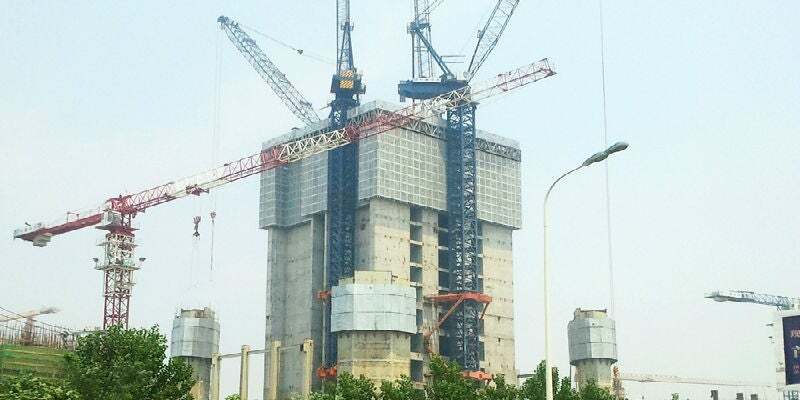 A record was set during the ongoing construction of the mega tower, when 621m of concrete was pumped at one time. The 117-storey tower will feature Grade-A office spaces from the 7th floor to the 92nd floor with a gross floor area of 280,000m². The offices will be leased to large domestic and multinational holdings. A five-star hotel will be located on the top floors offering panoramic views of the city and beyond. It will have a gross floor area of approximately 80,669m² and will occupy floors from level 94 to the top. Other features of Goldin Finance 117 include an indoor swimming pool, an observation deck and a revolving restaurant, all of which hold a record for being the highest located in the world. The tower will also include a 36-storey reinforced concrete office building, a retail area at the podium and three levels of basement car park and retail. Each storey of the tower at the lower levels will have a gross floor area of 3,633m². Guests and visitors will be transported to different levels via double-deck, high-rise elevators, which simultaneously uses a shared hoistway in two cars, which not only increases the building transportation system’s efficiency but also saves up to 40% of space. Arup has been selected to provide structural, geotechnical, wind and façade engineering. WSP | Parsons Brinckerhoff will function as the MEP consultant for the project as well as provide multiple services. Third Bureau of CSCEC is the main contractor on the project. SMI Engineering is responsible for the tower’s unitised curtain wall. Otis will supply the tower with 50 of its double-deck high-rise elevators. The tower also holds the record for being the world’s longest single elevator hoistway. Arcadis and Langdon & Seah are responsible for providing quantity surveying services on the project. United Technology Corporation’s Carrier Air Conditioning Sales & Service Co. was awarded a contract to supply 24 Carrier AquaEdge® centrifugal chillers.